The Law Unit and the History Unit of ATINER will hold a Stream on “Legal History (The Legal Foundation of the Modern State)”, 16-19 July 2018, Athens, Greece as part of the 15th Annual International Conference on Law sponsored by the Athens Journal of Law and the Athens Journal of History. The purpose of the interdisciplinary miniature stream is to introduce such legal institutions that have an effect on the development of the internal judiciary systems of different countries and are much in evidence in the contemporary legal reforms related to the foundation of the modern state. The combined examination of history and law can draw the attention of the legislators and legal historians of the 21st Century to the importance of such legal institutions which, if observed from the point of view of legal history, can assist modern codification. The historical legal institutions appearing in the law currently in effect, with the aid of a certain legal “restoration”, can help their understanding, however it does not simply require some sort of theoretical, dogmatic examination but also the analysis of the legal practice and the praxis. 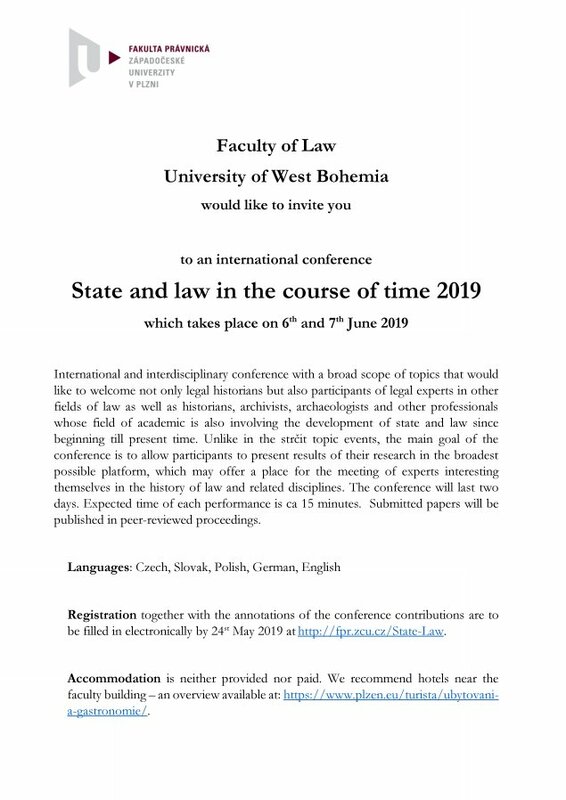 Due to the topic of the interdisciplinary stream, this may not only be interesting for people working in the field of law or legal history, but can also get the attention of historians and scientists and researchers working on other, various fields. Through the complex and comparative assessment of the different branches of law, we can come up with a general picture on the development and the role in contemporary legal development of each and every legal institution. 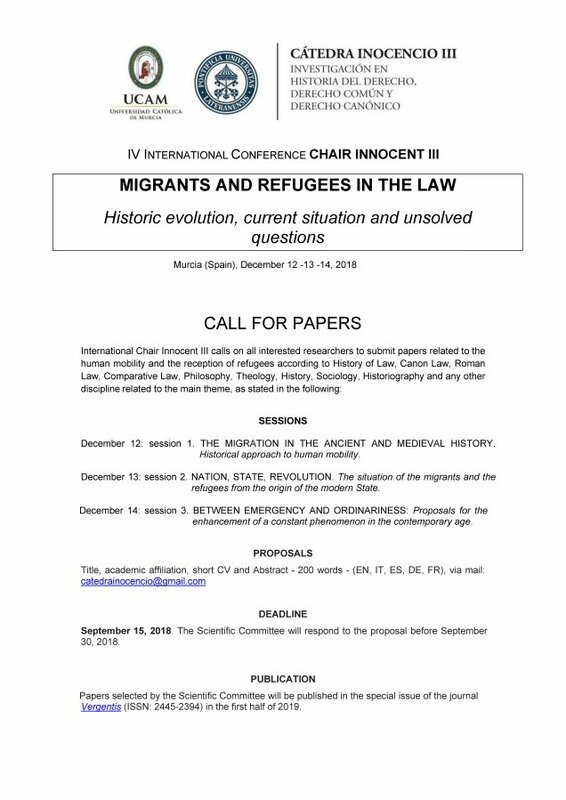 Please submit an abstract (email only) to: atiner@atiner.gr, using the abstract submission form by the 4 June2018 to: Dr. Varga Norbert, Associate Professor, Faculty of Law, University of Szeged, Hungary. Please include: Title of Paper, Full Name (s), Current Position, Institutional Affiliation, an email address and at least 3 keywords that best describe the subject of your submission. Decisions are reached within 4 weeks. The association was established in 1995 as an independent world association of Academics and Researchers. Its mission is to act as a forum where Academics and Researchers from all over the world can meet in Athens, in order to exchange ideas on their research, and to discuss future developments in their disciplines. The organizing and hosting of International Conferences and Symposiums, the carrying out of Research, and the production of Publications are the basic activities of ATINER. Since 1995, ATINER has organized more than 400 International Conferences and other events, and has published close to 200 books. In 2012, the Association launched a series of conference paper publications (click here), and at the beginning of 2014, it introduced its own series of Journals (click here). Academically, the Association is organized into seven Divisions and 37 Units. Each Unit organizes at least an Annual International Conference, and may also undertake various small and large research projects. Academics and Researchers are more than welcome to become members and to contribute to ATINER’s objectives. If you would like to become a member, please download the relevant form (membership form). For more information on how to become a member, please send an email to: info@atiner.gr. 5. Kolloquium für Kriminalität und Strafjustiz in der Neuzeit. 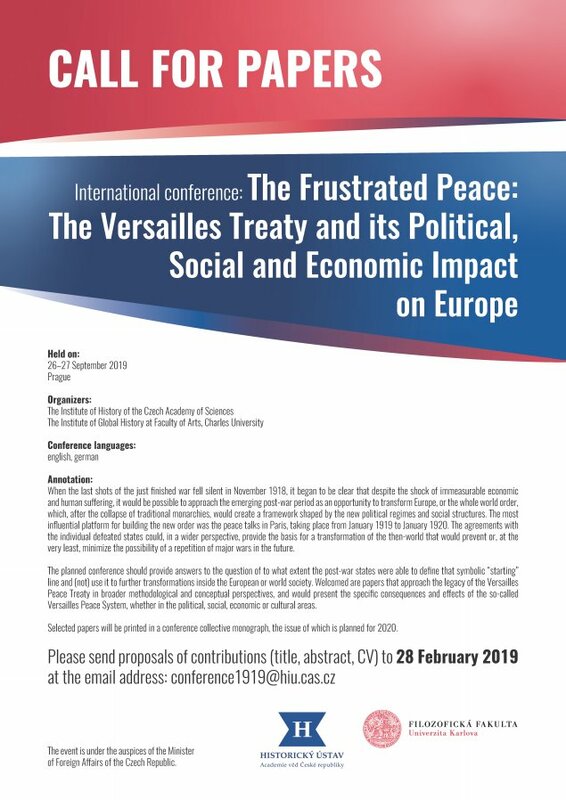 Registration form with annotation of the conference paper shall be filled in electronically via http://fpr.zcu.cz/historylaw no later than April 28th, 2017. Topics of the conference papers are not limited to any theme. We are kindly offering the participants opportunity to present their actual results of their researches or to present with their favourite themes. 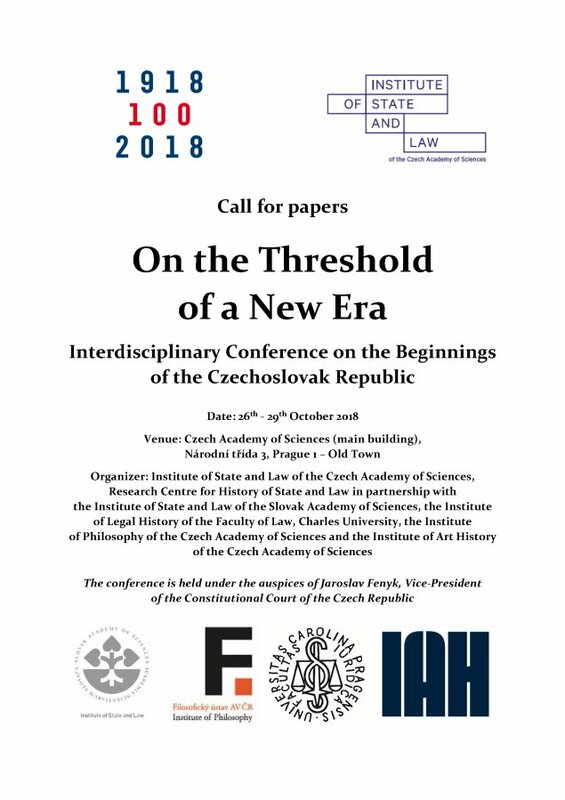 We would like to prepare specialized panel that shall allow the respective institutes of legal history especially from Czech and Slovak republics to present their actual pedagogical activities. All presentations of paper shall be approximately 15 min. and the papers shall be published then in conference publication. "JUSTICE, MERCY AN LAW: from revenge to forgiveness in the History of Law"
The Organising Committee of the 4th Biennial Conference and the Executive Council of the European Society for Comparative Legal History are pleased to call for papers for the upcoming conference to be held on 28 June – 1 July 2016 at the University of Gdańsk (Poland) on: “Culture, Identity and Legal Instrumentalism”. 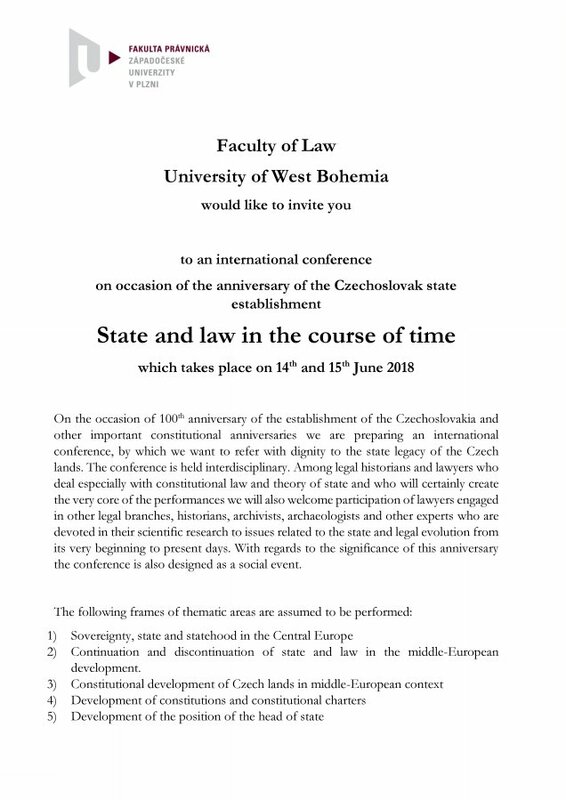 The conference will focus on the issue of law as an instrument of transforming reality in the individual cultural circles and sub-circles of Europe and the world. Papers addressing this theme are welcome, to be submitted before 15 November 2015 as explained in the below document. The organizers of the conference called Bibliotheca Antiqua, would like to invite you to take part in this event. 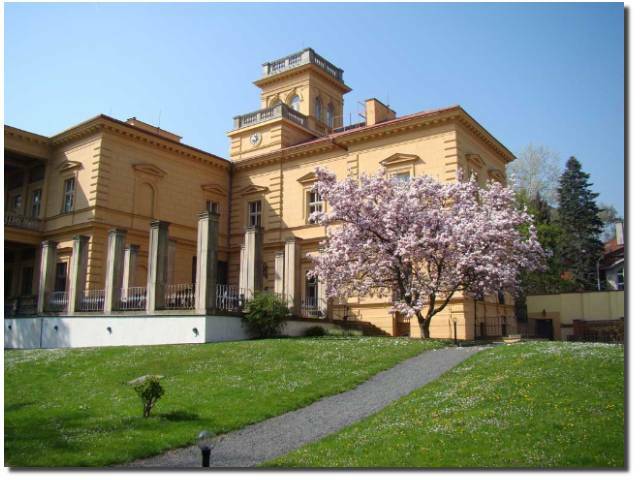 The conference will take place in Olomouc on November 4 - 5, 2015 at The Olomouc Archdiocesan Museum (The Mozarteum hall). 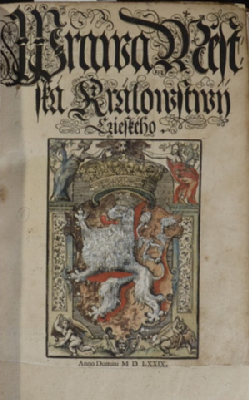 The theme of the conference for the year 2015 is: law in rare books and manuscripts. Topics that will be dealt with are for example: law prints and manuscripts, law history, development of city law and law of the Lands, procedural law etc. Part of the event will be devoted solely to the topic of rare books and manuscripts. The authors are requested to send the application form along with the annotation of the speech until the 8th of August, 2015.The time of the conference program is limited, therefore the priority will be given to speeches closest to the theme of the conference. The organizers will not arrange the accommodation. The conference fees will be updated in the year 2015, tentatively it is 150 CZK for authors, 400 CZK for the others (SDRUK members 350 CZK). We are looking forward to meeting you in Olomouc. Bedingt durch den Zweiten Weltkrieg startete in den meisten europäischen Ländern innerhalb der Sozialpolitik eine radikale Wende. Sowohl die mit der Weltwirtschaftskrise verbundenen Erfahrungen während der 1930er Jahre, welche die Grenzen der damaligen Sozialschutzsysteme aufzeigte, als auch die Kriegsmobilisierung aller beteiligten Länder schufen unter den Bedingungen des totalen Krieges den Bedarf nach neuen Wegen des Social Engineering. Die Nachkriegssozialpolitik knüpfte an mehrere Methoden an, welche im kontinentalen Europa während des Krieges implementiert und von den Besatzungsregimen ausgeführt wurden. Diese sozialpolitischen Strategien hatten eine große Bedeutung und waren nicht nur augenscheinlich autonom in Bezug auf die ideologische Legitimierung seitens einzelner politischer Regime der 1930er und 1940er Jahre (liberale Demokratie, Faschismus/Nationalsozialismus, bolschewistischer Sozialismus), sondern auch in Bezug auf geographische Gebiete sowie deren Bevölkerung, die mittels solcher Strategien im Sinne der Ziele der nationalsozialistischen Expansion ausgebeutet wurden. Das Ziel dieser Tagung ist es, die Sozialpolitik als ein Instrument nationalsozialistischer Herrschaft komparativ zu betrachten sowie ihre Durchsetzung in den besetzten Ländern Europas zu beschreiben. Ein Vergleich der besetzten Gebiete im Osten und Westen erlaubt es uns, den wesentlichen Rahmen des sozialpolitischen Alltags zu charakterisieren sowie die unterschiedlichen Besatzungsstrategien tiefergehend zu erklären. November 24, 2011 (Thursday) 2 p.m. 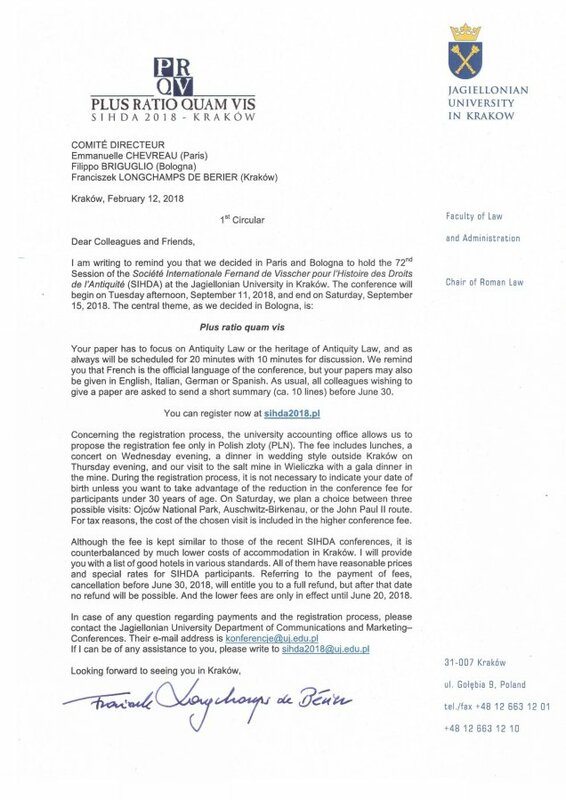 I am writing to give you information on an international conference Regnare et administrare – history of the political system and administrative law, 21-22th April, 2012. The event is organized by employers, PhD students and members of the Student Learned Society of the Faculty of Law and Administration at the Jagiellonian University. 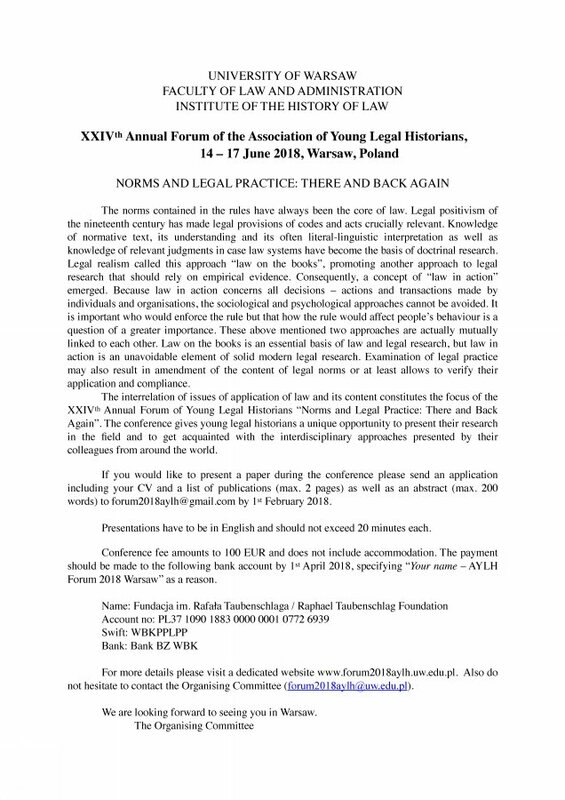 We would like to invite young researchers of law and the history of law: graduate students, PhD students and PhD graduates. 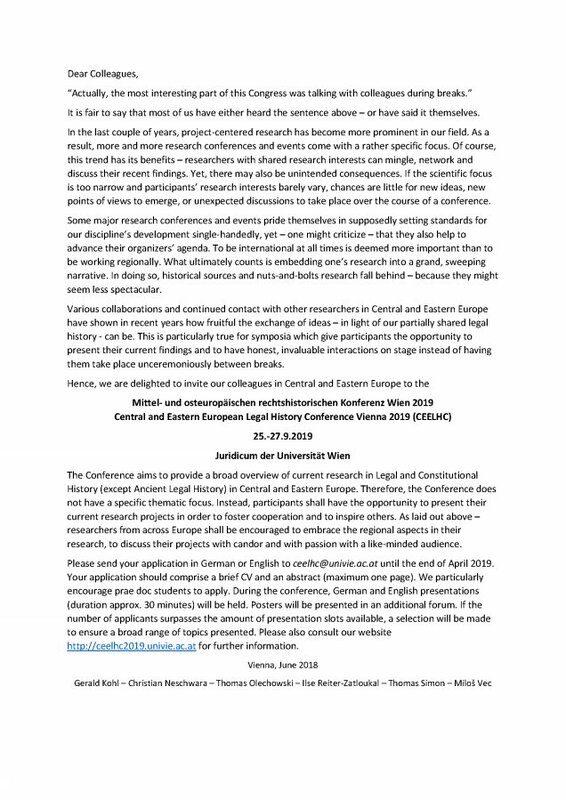 Applications for the conference should be received until the 18th March 2012 onan application form and should include a shortsummary of main theses (maximum 300 words; methodology, bibliography). The applications will be verified and subsequently a response will be send. What is essential, the positive decision is required to make a payment. A presentation cannot take longer than 20 minutes and texts for publishing cannot exceed the length of 20000 characters. Two languages will be used during the conference: Polish and English. An edited book, composed of verified texts, is expected to be published, likewise antecedent events. We provide participants with meals during the conference. A conference fee is fixed at 140 zlotys (PLN)/35 (euro). Acommodation is not included, nevertheless help with finding hotel or hostel will be provided. We strongly invite you to come to Krakow. Im Juni 2011 läuft das zweihundertste Jubiläum der Entstehung der bedeutenden Kodifikation des bürgerlichen Rechts, des Allgemeinen Bürgerlichen Gesetzbuches ab. Zugleich laufen 260 Jahre seit der Geburt des berühmten österreichischen Juristen, des Rektors der Wiener Universität und insbesondere des führenden ABGB-Redakteurs Franz von Zeiller, ab. Im Zusammenhang mit dem aktuell zu beendigenden Entwurf des neuen Bürgerlichen Gesetzbuches in der Tschechischen Republik und der Kodifikationsentwicklung auf dem Privatrechtsgebiet in anderen Ländern der Visegrad-Gruppe bietet sich eine einmalige Möglichkeit für ein interdisziplinäres Fachtreffen. Als Ziel des internationalen Kolloquiums junger Rechtswissenschaftler wird die Fachdiskussion zur Kodifikationsgenese des Privatrechts und derer Gedankenhintergrund angesehen. Organisationsteam: JUDr. Alena Rundová, Ph.D., LL.M. ; JUDr. Vilém Knoll, Ph.D. The program is followed by reception. Venue: ELTE Aula Magna, 1053 Budapest, Egyetem tér 1-3. Scientific Guarantor: prof. JUDr. Ladislav Vojáček, CSc. The topic of this section is the evolution of private law from the roman and antique law to present. The points of interests are especially: evolution of categorization of private versus public law, the history of great privat law codifications, evolution of private law instistutes. Also the political context and its influance on private law is one of the points of interests. which takes place on May 20, 2010 (Thursday) at 11 a.m. The next congress of the International Committee of Historical Sciences (ICHS) will be held in Amsterdam in 2010, from 22 - 28 August. The International Congress of Historical Sciences takes place every five years. This Congress provides an ideal venue for extensive reports, papers, debates, exchanges, and meetings reflecting historical research in action. It is the meeting place for the global community of historians. In recent years the Congress has been held in Madrid (1990), Montreal (1995), Oslo (2000), and Sydney (2005). The Congress' themes were adopted by the General Assembly of the CISH of 2007. In 2006 the Secretary General issued a call for theme/session proposals. findet von 15. - 18. September 2010 in Münster statt. The University of West Bohemia in Plzeň /Czech Republic/, Faculty of Law organized the Conference „Naděje právní vědy“ /The Hope of Jurisprudence/ from the 23th to 25th April 2010. 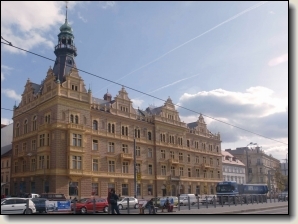 This conference took up on the tradition of conferences from the years 2006 and 2007 and was held at the same place, and that was the castle-hotel Býkov, a historical building from the 18th century. Seventy five PhD-students and young teachers from faculties of law from the Czech Republic, Slovakia and Poland met together this year. The participants were organized in nine sections, and the section of legal history and civil law were the most numerous. But also in the other sections, (crime law, administrative law, tax law, industiral law, processual law and constitucional law and legal theory), there were many participans, which presented the results of their research projects. Hopefully, the tradition of this session will continue in the future, and even with more participants from other foreign countries. On the 27th and 28th May 2010, the Palacký University Olomouc /Czech Republic/ organized the fifth conference „Olomoucké právnické dny“ . This year, more than one hundred fifty participants met in 9 sections, where each of them had a special topic. In the section of legal history and legal theory, it was „ Polemics and Causes in Jurisprudence“. The first day in this section was devoted to theory of law, and legal history was the main topic on Friday. The contributions were targeted on polemics of ideas /e.g. D. Krošlák: Hart versus Fuller, P. Dostalík: Obligation or real character of groud-rent - discord between F. Weyer and M. Boháček/, the matters in controversy /e.g. 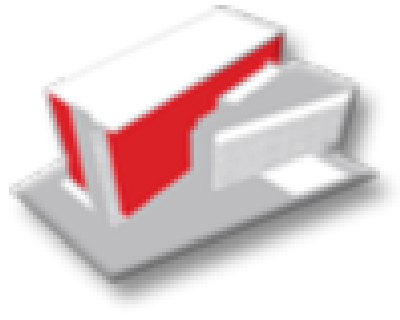 H. Peterková: „Euthanasia, the request of patient and the legal probation of the finishing of therapy“, P. Salák: „The ring from your gold... – locatio-conductio versus emptio-venditio.“/, but also on great causes /e.g. M. Frýdek: Cicero´s processual strategy againts Verres /. która odbędzie się w Instytucie Historycznym Uniwersytetu Wrocławskiego w dniach 23–24 listopada 2017 roku. Magia, czary, okultyzm, duchy, zjawy i przeróżne widziadła towarzyszą społeczeństwom od zarania dziejów. Wiara w czary i czarownice (czarowników), a wraz z nimi zabobony, w niektórych kręgach kulturowych pozostały i są praktykowane po dzień dzisiejszy. Uwidacznia się to zwłaszcza w przypadku magii leczniczej, pozostającej na pograniczu magii i medycyny. Zjawisko posługiwania się czarami miało nie tylko w swoim zamyśle być wymierzone w uzyskanie efektu negatywnego, niszczącego działania, ale też dać danej jednostce możliwość wzbogacenia się, stąd przeróżne „pakty” zawierane z siłami nieczystymi, ale też opętania przez diabły, demony czy złe duchy i związane z nimi egzorcyzmy, mające prowadzić do uwolnienia osoby zawładniętej przez Szatana. Świat okultyzmu, magii, zwłaszcza tej szkodliwej i związanych z nią szeregu przeróżnych istot, których część okazała się demoniczna i złowrogo nastawiona wobec pozostałych przy życiu ludzi, od wieków budzi zarówno zainteresowanie, jak i trwogę. Wierzenia w szkodliwą aktywność zmarłych zakorzeniona jest we wszystkich kulturach. Magia demoniczna przyzywać miała złe duchy o cechach demonicznych. Społeczeństwa średniowieczne, a po nich nowożytne przejęły tego typu wierzenia, których korzeni należy szukać jeszcze w pogańskich praktykach pogrzebowych. Z kolei strach przed złymi duchami, demonami, diabłem, zjawami bytującymi i błąkającymi się w świecie żyjących czy „ożywieńcami” towarzyszył społeczeństwom od tysięcy lat. Z jednej strony wszyscy oni nie byli już jednostkami przynależnymi do społeczności żywych, z drugiej często za popełnione grzechy nie mogli znaleźć spokoju w świecie umarłych – zaświaty ich odrzucały. Okres największego nasilenia egzorcyzmów, przeróżnych „paktów” z mocami diabelskimi, polowań na czarownice przypadał na stulecia XVI–XVIII, chociaż pierwsze stosy w Europie zapłonęły już w okresie późnego średniowiecza. Procesy o czary to szczególnie interesujący obszar badawczy, dający możliwość naukowcom interdyscyplinarnego oglądu tej problematyki. Z jednej strony związany jest z pewną nutą tajemniczości, mamy do czynienia ze zjawiskami niewytłumaczalnymi, trudnymi do pojmowania przez ówcześnie żyjących. Z drugiej zaś wokół problematyki polowań na czarownice narosło wiele mitów, przeinaczeń, wypaczeń, stereotypów, a wręcz przekłamań i błędnych wniosków, których potwierdzenia nie odnajdziemy w zachowanym materiale źródłowym (księgi sądowe). Weryfikowanie tez pojawiających się w starszej literaturze i falsyfikowanie mitów pozostaje ważnym zadaniem stojącym przed współczesnymi badaczami tego zagadnienia. magia szkodliwa i magia lecznicza – występowanie i odbiór społeczny. Zgłoszenia na formularzu zgłoszeniowym wraz z informacją o tytułach referatów prosimy nadsyłać na adres poczty elektronicznej daniel.wojtucki@wp.pl, p.klint@wp.pl lub jakub.weglorz@uwr.edu.pl do 30 września 2017 r. Opłatę konferencyjną w wysokości 150 zł prosimy uiścić na konto 97 1090 2503 0000 0001 1093 9538 z dopiskiem: Historia „Czary i zjawiska demoniczne”. W ramach opłaty konferencyjnej organizatorzy zapewniają dwa noclegi oraz wyżywienie. Nacionalizace a politizace veřejné správy ve střední Evropě 1848–1948. Úředník sluhou mnoha pánů? Přihlášky spolu s anotacemi konferenčních příspěvků prosíme vyplnit elektronicky nejpozději do 28. dubna 2017 na adrese: http://fpr.zcu.cz/pravnehistoricka. Konferenční příspěvky nejsou tematicky omezeny. Nabízíme tak účastníkům možnost prezentovat právě dosažené aktuální výsledky jejich bádání či představit svá oblíbená témata. V rámci konference bychom rádi zařadili zvláštní sekci, ve které by jednotlivá právněhistorická pracoviště představila aktuální stav a perspektivy své pedagogické činnosti. Předpokládaná délka příspěvků je cca 15 min., přednesené příspěvky budou publikovány v postkonferenční publikaci. Předpokládaná délka příspěvků cca 15 min., přednesené příspěvky budou publikovány v postkonferenční publikaci. v priestoroch Právnickej fakulty Univerzity Komenského v Bratislave. Touto cestou si Vás dovoľujeme pozvať v poradí na piate stretnutie doktorandov a postdoktorandov z odboru právnych dejín a rímskeho práva. Tento ročník bude od tých minulých trochu odlišný, rozhodli sme sa usporiadať konferenciu monotematicky. V prípade, ak by si chcel účastník konferencie zvoliť príspevok mimo témy konferencie, samozrejme každému vyjdeme v ústrety, článok však nebude zaradený do zborníka, ale bude publikovaný v časopise Historia et theoria iuris (HTI). Konferenčný poplatok sa nevyberá, ubytovanie a cestovanie si hradia účastníci sami. Bude tiež možné objednať si ubytovanie v hoteli Družba v Bratislave (cca 20 €). V prípade záujmu o aktívnu účasť na konferencii prosíme o zaslanie prihlášok s názvami príspevkov do 30. mája 2017 na adresu alexandra.letkova(at)flaw.uniba.sk. Príspevok bude potrebné odovzdať do 30. septembra 2017. Z konferencie bude vydaný recenzovaný zborník. JUDr. Alexandra Letková, Mgr. Ján Sombati, PhD. která se bude konat ve dnech 10. a 11. listopadu 2016. Právní obyčej je patrně nejstarší pramen práva, který stál u základů všech právních řádů. Témata mohou být zaměřena jak na jeho podobu a podstatné znaky, tak i na jednotlivé obyčeje, jež právní řád formovaly. Stejně tak je možné se zaměřit i na poměr právního obyčeje k ostatním pramenům práva a jeho význam dnes. který se bude konat dne 22. září 2016 od 10.00 hod. Karlovské výročí nás nabádá k dalšímu zkoumání osobnosti Karla IV. Téma „Symbolika, paměť a kult na příkladu zpřítomňování císaře a krále Karla IV.“ otevírá možnost soustředit se na otázky právního a politického symbolismu a historické paměti. vzájemný poměr Svaté říše římské národa německého a českého státu. Podrobný program pracovního semináře s tématy příspěvků bude účastníkům oznámen nedlouho po skončení přihlašování. Vybrané příspěvky budou publikovány v kolektivní monografii. Poplatek na pracovní seminář není vybírán. Občerstvení bude zajištěno. Ubytování není hrazeno; účastníci si ubytování zajišťují sami. 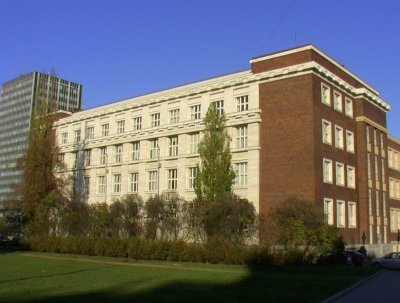 v prostorách Právnické fakulty Masarykovy univerzity v Brně. Letošní konference se bude věnovat dvěma souvisejícím skupinám trestných činů, a to trestným činům proti majetku a hospodářským trestným činům. Majetkové delikty provázejí lidstvo od samého počátku jeho existence a náleží k těm trestným činům, které byly postihovány od pradávna. Tento postih se však v průběhu věků samozřejmě měnil. Konference se dále dotkne fenoménu trestných činů, které jistým způsobem narušují ekonomický či hospodářský život společnosti. Půjde nám o jednání, jež ohrožují daný hospodářský řád nebo – snad přesněji řečeno – stanovená pravidla fungování jednotlivých subjektů v tomto řádu. Účastníci připravované konference by se tedy měli zamýšlet nad nejrůznějšími jevy spojenými s právní úpravou postihu trestné činnosti zasahující do vlastnického práva a narušující ekonomický a hospodářský život od počátků až do současnosti. Naše konference volně naváže na tři velice úspěšné konference, které se na Právnické fakultě MU konaly v předcházejících letech. zkušenosti z vyšetřování trestných činů proti majetku a hospodářských trestných činů. Po obdržení přihlášek rozhodnou organizátoři o zařazení příspěvku do programu konference, případně pouze o jeho písemné publikaci. Písemné verze příspěvků budou publikovány v monotématickém recenzovaném sborníku. Pokud se nebudete moci konference osobně zúčastnit a máte o téma konference zájem, rádi v konferenčním sborníku uveřejníme Váš zaslaný příspěvek. Přihlášku na konferenci či přihlášku příspěvku je nutné zaslat do 30. dubna 2016.
v prostorách Právnické fakulty Univerzity Palackého v Olomouci. Tématem letošní sekce, kterou garantuje Katedra teorie práva a právních dějin, je Právo a hodnoty. Příspěvky na toto téma mohou být zpracovány nejen teoretickoprávně, ale také z pohledu historického, případně pozitivněprávního. Písemné verze příspěvků budou publikovány v recenzovaném sborníku. Pokud se nebudete moci konference osobně zúčastnit a téma vás zaujalo, rádi v konferenčním sborníku uveřejníme váš příspěvek. Veškeré informace o přihlašování a programu konference jsou na stránce www.opdny.upol.cz. Medzinárodná vedecká konferencia sa bude konať v dňoch 17. – 18. marca 2016 na pôde Právnickej fakulty UMB v Banskej Bystrici, Komenského 20, Banská Bystrica. Poslaním konferencie je prezentácia výsledkov vedecko-výskumnej činnosti z oblasti moderných dejín štátu a práva, vytvorenie priestoru na nadviazanie a prehĺbenie spolupráce s domácimi a zahraničnými univerzitami a výmena skúseností a poznatkov s vedecko-výskumnými pracovníkmi. Prínosom konferencie má byť takisto zintenzívnenie komunikácie medzi katedrami dejín štátu a práva jednotlivých právnických fakúlt a možnosť publikovať vedecké štúdie v recenzovanom vedeckom zborníku. Konferencia je určená najmä pre vedecko-výskumných a vedecko-pedagogických pracovníkov z odboru dejín štátu a práva a z príbuzných odborov. ktorá sa uskutoční dňa 5. novembra 2015 v priestoroch Právnickej fakulty Univerzity Komenského v Bratislave. Konferenčný poplatok sa nevyberá, ubytovanie a cestovanie si hradia účastníci sami. Bude tiež možné objednať si ubytovanie v hoteli Družba v Bratislave (cca 20 €). V prípade záujmu o aktívnu účasť na konferencii prosíme o zaslanie prihlášok s názvami príspevkov do 12. októbra 2015 na adresu alexandra.letkova(at)flaw.uniba.sk. Príspevok bude potrebné odovzdať do 1. 12. 2015. Z konferencie bude vydaný recenzovaný zborník. Trestné činy proti životu a zdraví jsou bezpochyby jedněmi z nejzávaznějších skutkových podstat, neboť se dotýkají těch nejzákladnějších životních hodnot. Náleží k těm trestným činům, které byly pro jejich vysokou nebezpečnost od pradávna trestněprávně postihovány, tento postih se však v průběhu věků měnil. Naše konference volně navazuje na naši velice úspěšnou loňskou konferenci „Sexuální trestné činy včera a dnes“ a má vytvořit tak určitou tradici setkávání právních historiků, specialistů na trestní právo z České a Slovenské republiky, jakož i odborníků z trestněprávní praxe (vyšetřovatelů, soudních znalců či lékařů) u vybraných otázek trestního práva. Připravovaná konference se tedy zamyslí nad nejrůznějšími jevy spojenými s právní úpravou postihování trestné činnosti směřující proti životu a zdraví člověka od počátků až do současnosti. zkušenosti z vyšetřování trestných činů proti životu a zdraví trestných činů. Po obdržení přihlášek rozhodnou organizátoři o zařazení příspěvku do programu konference, případně pouze o jeho písemné publikaci. Písemné verze příspěvků budou publikovány v kolektivní monografii. Pokud se nebudete moci konference osobně zúčastnit a máte o téma konference zájem, rádi v konferenčním sborníku uveřejníme Váš zaslaný příspěvek. Konferenční poplatek není vybírán. Autoři, kteří přispějí do připravované kolektivní monografie, obdrží po jejím vydání elektronickou verzi ve formátu pdf. Přes e-shop vydavatelství si pak budou moci zakoupit tištěnou verzi. Přihlášku na konferenci či přihlášku příspěvku je nutné zaslat do 7. května 2015. Plánované setkání doktorandů a postdoktorandů v oboru právních dějin má začínajícím vědeckým pracovníkům umožnit výměnu zkušeností z jejich dosavadního studia a akademického života a vzájemnou prezentaci dílčích výsledků bádání, vycházejících především z témat jejich disertací. Vzájemné seznámení a časté setkávání považujeme za velmi důležité, neboť vytváří prostor pro rozvoj vztahů do budoucna a rovněž pro spolupráci a možnost udělení např. mezifakultních grantových podpor. Spolu s doktorandy rádi přivítáme i jejich školitele. Přítomní akademičtí pracovníci tak dostanou možnost seznámit se s doktorandy z ostatních českých a slovenských fakult, což umožní rozvíjení případné další odborné spolupráce. Touto konferencí navazujeme na naši tradici, tedy na úspěšné semináře doktorandů Katedry dějin státu a práva PrF MU konané za účasti jejich školitelů a na publikování přednesených referátů v konferenčních sbornících a na internetu a samozřejmě také na předchozí dva ročníky česko-slovenského setkání, které se uskutečnily v Brně a v Bratislavě. „moderní“ dějiny státu a práva. Písemné verze příspěvků budou publikovány v recenzovaném konferenčním sborníku. Přihlášku na konferenci je nutné zaslat do 20. května 2015 přes konferenční systém PrF MU. ktorá sa uskutoční pod záštitou dekana PrF UMB Mult. Dr. h. c. prof. JUDr. Mojmíra MAMOJKU, CSc. na pôde Právnickej fakulty UMB v Banskej Bystrici, Komenského 20, Banská Bystrica. Jedná se o 24. ročník konference na téma historických knižních fondů, která v roce 2012 změnila název z původního Problematika historických a vzácných knižních fondů na Bibliotheca Antiqua. Konference se uskuteční ve dnech 4.-5. listopadu 2015 v Olomouci v prostorách Arcidiecézního muzea (sál Mozarteum). V roce 2015 bude konference tematicky zaměřena na právní tisky a rukopisy, na právní historii obecně, vývoj městského i zemského práva, práva materiálního i procesního etc. Část konference bude věnována obecně tématice historických a vzácných knižních tisků a rukopisů. Autory žádáme, aby spolu s přihláškou zaslali anotaci příspěvku. Program konference je omezen délkou jejího konání a v případě převisu zájmu o vystoupení dostanou přednost příspěvky mající blíže k tématu. Termín přihlášení, jakož i odevzdání příspěvků je 31. 8. 2015. Autoři příspěvků si zde stáhnou šablonu příspěvku, kterou se budou řídit. Poplatky za konferenci budou aktualizovány v roce 2015, předběžně je to 150 Kč pro autory příspěvků, 400 Kč pro ostatní. Členové SDRUK hradí 350 Kč. Konferencia sa bude konať v rámci projektu "Kontinuita a diskontinuita práva na Slovensku v 20. storočí a jej vplyv na právny poriadok SR" podporený Agentúrou pre podporu výskumu a vývoja na základe zmluvy č. APVV-0607-10. Konference proběhne formou dvou autonomních seminářů, z nichž první se uskuteční ve dnech 16. – 17. 9. 2014 v Praze. Konferenční jednání proběhne v aule hlavní budovy Filozofické fakulty Univerzity Karlovy v Praze na náměstí Jana Palacha 2 (stanice metra Staroměstská). Tento seminář bude věnován Podkarpatské Rusi v období první československé republiky, tedy v letech 1918–1938. Druhý seminář se bude konat ve dnech 16. – 17. 10. 2014 v konferenční místnosti hlavní budovy Historické fakulty Užhorodské národní univerzity. Součástí programu konferencí bude v Praze i v Užhorodu vernisáž výstavy „Podkarpatoruští občané v boji za svobodu Československa v letech 1938 – 1945. (přesný čas a místo konání budou upřesněny). Na každý z obou seminářů je třeba se přihlásit samostatně, a to jak k aktivní, tak i pasivní účasti. Podkarpatoruská společnost v letech Velké války, podkarpatoruský exil v USA, rusínské jednotky v rámci čs. legií, proces připojení Podkarpatské Rusi k Československému státu 1918–1919, boje a vojenská diktatura na Podkarpatské Rusi, budování občanské společnosti, politické strany ve 20. a ve 30. letech, parlamentní volby a podkarpatoruská politika v Praze, politika československé vlády na Podkarpatské Rusi, národnostní menšiny v době 1. republiky, spor mezi ruským (rusínským) a ukrajinským proudem, boj za autonomii a autonomisté, národnostní menšiny, právní postavení Podkarpatské Rusi z hlediska československého a mezinárodního práva, kultura, významné osobnosti všech oblastí podkarpatoruského života, modernizace země ve 2. a 30. letech, hospodářství a velká hospodářská krize, každodennost, první pokus o zavedení autonomie v roce 1937, Češi na Podkarpatské Rusi. Podkarpatská Rus v plánech na obranu státu 1938, přeměna Československa ve spolkový stát a podkarpatoruská autonomie, Vídeňská arbitráž, Karpatská Sič, totalitarizace podkarpatoruské společnosti v letech 1938–1939, březen 1939 – vyhlášení nezávislosti, boje čs. jednotek, obsazení země Maďary, represe proti různým skupinám obyvatelstva ze strany maďarského okupačního režimu, Augustin Vološin a karpatoukrajinský exil v českých zemích a na Slovensku v letech 1939–1945, domácí odboj proti maďarské a německé okupaci, podkarpatoruští občané v táborech GULAG v letech 2. světové války, podkarpatoruští občané v řadách československých zahraničních jednotek na Východě a na Západě, Podkarpatská Rus v plánech a představách československého zahraničního a domácího odboje, Edvard Beneš a Podkarpatská Rus, Podkarpatoruská kancelář čs. exilového Ministerstva vnitra v Londýně, Československá vládní delegace a snaha o obnovení čs. státnosti na Podkarpatské Rusi v letech 1944–1945, sovětská okupace a anexe, Zakarpatská Ukrajina a její právní postavení, Ivan Turjanica, KSČ a Zakarpatská Ukrajina, Čs. – sovětská smlouva o připojení Podkarpatské Rusi k SSSR, exulanti z Podkarpatské Rusi v Československu po roce 1945 a právní důsledky připojení k SSSR. Jednací jazyk konference: čeština/slovenština, ukrajinština, angličtina. Příspěvky z konference budou vydány v kolektivní monografii, která paralelně vyjde v Praze v českém a v Užhorodu v ukrajinském jazyce do konce roku 2014. Pro aktivní účastníky konference bude v Praze zajištěno ubytování na dvě noci. Ostatním účastníkům může být přes organizátory konference zprostředkována rezervace odpovídajícího ubytování v univerzitních ubytovacích zařízeních. Cestovné si účastníci hradí sami. Uzávěrka přihlášek na oba semináře je 31. 5. 2014.
v zasedací místnosti Právnické fakulty Masarykovy univerzity v Brně. Sexuální trestná činnost náleží bezesporu k oblastem, které vždy přitahovaly a dodnes přitahují značnou pozornost veřejnosti i médií. Sexuální trestné činy patří k těm trestným činům, které byly pro jejich vysokou nebezpečnost od pradávna trestněprávně postihovány, protože zasahovaly do osobní svobody a důstojnosti jedince, do jeho pohlavní integrity či do zdravého vývoje mladistvých. Připravovaná konference se tedy zamyslí nad nejrůznějšími jevy spojenými se sexuální trestnou činností a právní úpravou od počátků až do současnosti. zkušenosti z vyšetřování sexuálních trestných činů. Po obdržení přihlášek rozhodnou organizátoři o zařazení příspěvku do programu konference, případně pouze o jeho písemné publikaci. Písemné verze příspěvků budou publikovány v recenzovaném sborníku, případně v monografii. O formě bude rozhodnuto po odevzdání příspěvků. Pokud se nebudete moci konference osobně zúčastnit a máte o téma konference zájem, rádi v konferenčním sborníku uveřejníme Váš zaslaný příspěvek. Přihlášku na konferenci či přihlášku příspěvku je nutné zaslat do 31. března 2014.
ve velkém sále Moravského zemského archivu v Brně. V polovině března 2014 uplyne 75 let od okamžiku, kdy byly české země obsazeny německou armádou a došlo k vyhlášení Protektorátu Čechy a Morava. Účelem připravované konference je především se zamyslet se nejen nad státoprávní problematikou „tzv. Protektorátu“ a otázkami spojenými s procesem likvidací druhé československé republiky, a to i v souvislosti se slovenskými a karpatoruskými snahami o autonomii v závěru roku 1938 a v prvních měsících roku 1939, nýbrž i konference je pojata šířeji tak, aby zahrnula všechny oblasti historického bádání v tomto období. Konferencí o „době nesvobody“ navazujeme tak na úspěšná kolokvia „Odraz německého národního socialismu ve třicátých letech v Československu a ve státech střední Evropy“ a „Češi a Němci v Československu“, které se konaly v loňském roce v Brně. Slovensko 1939-1945 a jeho vývoj (Slovenské národní povstání). Po obdržení přihlášek rozhodnou organizátoři o zařazení příspěvku do programu konference, případně pouze o jeho písemné publikaci. Písemné verze příspěvků budou publikovány v recenzovaném sborníku. Pokud se nebudete moci konference osobně zúčastnit a máte o téma konference zájem, rádi v konferenčním sborníku uveřejníme Váš zaslaný příspěvek. Přihlášku na konferenci či přihlášku příspěvku je nutné zaslat do 1. března 2014. Podrobnější odborný program s tématy referátů bude zveřejněn na začátku měsíce března. 14.00-16.30 - Ewa Stawicka - Henryk Krajewski - advokát. Povstalec 1863.
v malém sále Moravského zemského archivu v Brně. Vědecké kolokvium se bude věnovat vědeckým osobnostem a šiřitelům rostislavovského a cyrilometodějského odkazu v oblasti vědy i církevního života a bude se zabývat ohlasy tohoto odkazu na Moravě i v celé Evropě. 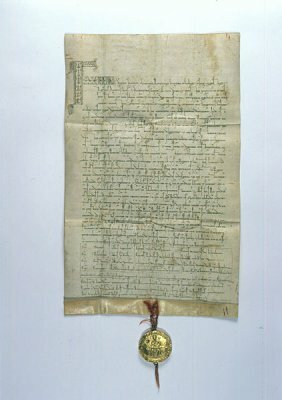 Věříme, že Vaše účast na této vědecké akci vytvoří důstojný rámec oslav 1150. výročí příchodu sv. Cyrila a Metoděje na Moravu a přinese nové poznatky k této problematice. Z kolokvia vyjde recenzovaný sborník. Přihlášku na kolokvium či přihlášku příspěvku je nutno zaslat do 30. září 2013 na emailovou adresu jlbily@volny.cz a v kopii na info@historyoflaw.eu (uveďte prosím předpokládaný název příspěvku a vaše kontaktní údaje vč. akademických titulů a pracoviště). Další informace o kolokviu Vám poskytne doc. JUDr. Jiří L. Bílý, Ph.D., Eq.M. (jlbily@volny.cz). Po obdržení přihlášek rozhodnou organizátoři o zařazení příspěvku do programu kolokvia, případně pouze o jeho písemné publikaci. Písemné verze příspěvků budou publikovány v recenzovaném sborníku. Podrobnější odborný program s tématy referátů bude zveřejněn na začátku měsíce října. Cílem konference je prezentace vědeckých prací zejména mladých vědeckých pracovníků z širokého spektra jednotlivých právních oborů, které budou posléze vydány v tištěném recenzovaném sborníku „Naděje právní vědy“. Součástí konference budou workshopy pořádané v rámci programu OP VK CZ.1.07/2.4.00/17.0119 „Spolupracující právníci“, zaměřené na problematiku vzdělávání právníků v oborech občanského práva, správního práva a finančního práva. Program konference bude účastníkům zaslán koncem měsíce listopadu 2013. Konferenční poplatek splatný na účet činí Kč 1 500,--. Je možno zajistit ubytování v místě v ceně Kč 750,-- na osobu a noc. Na konci září 2013 uběhne 75 let od okamžiku, kdy byla čtyřmi evropskými mocnostmi uzavřena tzv. Mnichovská dohoda, na jejímž základě bylo Československo donuceno odstoupit svá pohraniční území nacistickému Německu. Mnichovská dohoda byla završením činnosti Sudetoněmecké strany Konráda Henleina a vyvrcholením snah německých nacistů rozbít demokratické Československo, což bylo jedním z jeho postupných cílů k ovládnutí Evropy. Mnichovská dohoda je příkladem politiky ústupků – appeasementu. Účelem připravovaného kolokvia je především se zamyslet se nad vzájemným vztahem Čechů a Němců v meziválečném Československu a vůbec nad problematikou právního postavení německé menšiny ve dvacátých a třicátých letech dvacátého století. Navazujeme tak na úspěšné kolokvium „Odraz německého národního socialismu ve třicátých letech v Československu a ve státech střední Evropy“, které se konalo v únoru tohoto roku v Brně a na kterém se ukázalo, že si tato problematika vyžaduje ještě dalších odborných setkání. jak se Československo vyrovnávalo s hrozícím nebezpečím fašismu a jaká právní opatření k tomuto přijalo? jak Československo reagovalo na stále se zvyšující příliv německých uprchlíků a jaké postavení tito měli? Po obdržení přihlášek rozhodnou organizátoři o zařazení příspěvku do programu kolokvia, případně pouze o jeho písemné publikaci. Písemné verze příspěvků budou publikovány v recenzovaném sborníku. Pokud se nebudete moci konference osobně zúčastnit a máte o téma kolokvia zájem, rádi v konferenčním sborníku uveřejníme Váš zaslaný příspěvek. Touto konferencí navazujeme na naši tradici, tedy na úspěšné semináře doktorandů Katedry dějin státu a práva PrF MU konané za účasti jejich školitelů a na publikování přednesených referátů v konferenčních sbornících a na internetu. Přihlášku na konferenci je nutné zaslat do 31. května 2013 přes konferenční systém PrF MU. V pořadí již třetí právně-archeologické vědecké kolokvium se tentokráte věnuje problematice významu oděvu pro právo. Kolokvium tak navazuje na obdobná setkání zájemců o právní archeologii uspořádané v letech 2011 a 2012 v Praze. Věříme, že Vaše účast na této vědecké akci přinese nové poznatky k této problematice a tedy významně obohatí další vývoj právní archeologie. Z kolokvia opět vyjde recenzovaný sborník. Podrobnější odborný program s tématy referátů bude zveřejněn na začátku měsíce května. které se bude konat ve středu dne 27. února 2013 v prostorách Moravského zemského archivu v Brně. Dne 30. ledna 2013 uběhne 80 let od okamžiku, kdy byl v Německu Adolf Hitler jmenován říšským kancléřem. Toto datum je tak symbolicky považováno za okamžik uchopení moci nacisty a za počátek diktatury národních socialistů v Německu. Myšlenky národního socialismu se tak začaly šířit dále mimo hranice samotného Německa a především posílily a povzbudily národní cítění u Němců, kteří žili mimo hranice Německé říše, tedy hlavně v okolních státech. V druhé polovině třicátých let minulého století je tak možno vysledovat rovněž nacionální hnutí i v jiných státech a zavedení určitých fašizačních a totalitárních tendencí do jejich právních řádů. existují některé totalitární či fašizační prvky v právním řádu 1. ČSR? jak se odrazil německý národní socialismus v ostatních státech střední Evropy? Přihlášku na konferenci či přihlášku příspěvku je nutné zaslat do 15. ledna 2013.
garant: JUDr. Kamila Bubelová, Ph.D.
Mezinárodní vědecká konference Olomoucké právnické dny představuje nejvýznamnější událost, která se v oblasti vědeckého života na poli olomoucké právnické fakulty každoročně koná. Pro rok 2013 se organizační výbor konference rozhodl ponechat iniciativu na vedoucích jednotlivých odborných sekcí a stanovil pouze obecný rámec tématu konference: “Aktuální otázky českého práva”. Konference se bude již tradičně odvíjet ve dvou částech; po úvodních přednáškách, kde vystoupí významní odborníci se svými příspěvky, budou následovat tématicky zaměřené sekce (zaměření jednotlivých sekcí - viz Sekce konference). Věřím, že 7. ročník Olomouckých právnických dnů bude stejně úspěšný jako ročníky předcházející a že květnové setkání v Olomouci přinese opět velmi živou a plodnou vědeckou debatu. (místo konání bude dále upřesněno). Korupce je fenomén, který lidstvo sužuje již od nepaměti. Zejména v poslední době se stala v České republice snad tím nejaktuálnějším tématem, které neustále naplňuje stránky sdělovacích prostředků. Z toho důvodů se organizátoři rozhodli uspořádat na toto téma vědecké kolokvium. Kolokvium bude zaměřeno na postihnutí jednotlivých etap boje proti korupci, a to od nejstarších dob až do současnosti. Podrobnější odborný program s tématy referátů bude zveřejněn do konce měsíce února. Z příspěvků kolokvia bude vydán recenzovaný tištěný sborník. které se bude konat 6. května 2013 v Zaháňském salonku Senátu PČR. Konference se koná ve dnech 8. a 9. listopadu 2012 v budově klatovské radnice, nám. Míru 62, 339 01 Klatovy, v prvním patře. Součástí konference bude odhalení pamětní desky na Koldínově rodném domě. Konference bude zakončena společenským setkáním v pátek 9. listopadu od 17.00 hodin. Vstup na konferenci je volný. ve středověku a jejich důsledky pro další vývoj"
V letošním roce si připomínáme osmisté výročí vydání Zlaté buly sicilské, která je dnes všeobecně vnímána jako jeden z dokladů hlubokých kořenů české státnosti. 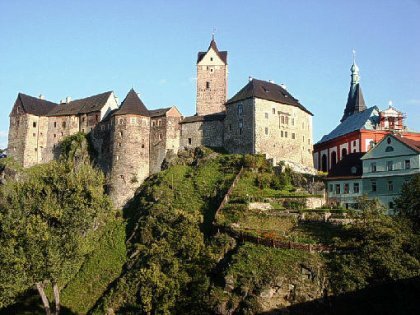 To je jistě dobrým důvodem pro setkání právních i obecných historiků a k zamyšlení se nad základními problémy existence a vývoje českého státu a jeho mezinárodního postavení ve středověku a na začátku novověku – především pak ve vztahu k jeho západním sousedům. Přihlášku na konferenci či přihlášku příspěvku je nutné zaslat do 30. června 2012. JUDr. Jaromír Tauchen, Ph.D., LL.M. Mezinárodní konferenci - „Sloboda advokácie v dejinách"
Slovenská republika tvorí súčasť regiónu strednej a východnej Európy a zdieľa množstvo tradícií s ostatnými krajinami, nevynímajúc tradície vývoja povolania. Cieľom vyššie uvedenej konferencie je umožniť vzájomné stretnutie odborníkov, ktorí sa venujú dejinám povolania, umožniť nadviazanie kontaktov medzi nimi a potvrdiť tradičné hodnoty všetkých právnických povolaní. E-mailem, nebo poštou zašlete na adresu: Muzeum Vysočiny Havlíčkův Brod, p. o. Havlíčkovo náměstí 19, 580 01 Havlíčkův Brod, Česká republika, e-mail: muzeum@muzeumhb.cz. Sociální politika transatlantické civilizace se nachází na rozcestí. „Zapomenutý“ protiklad chudí-bohatí nabývá opět aktuální (globální) dimenze. Ekonomická a sociální krize – včetně nynější krize sociálního státu – vyvolává snahu po hledání východisek k řešení také v minulé sociální praxi. Proto bude užitečné připomenout si genezi problému chudinství a dosavadní modely řešení chudoby od poloviny 18. století do poloviny 20. století formou historického workshopu. Přijmeme-li periodizační členění chudinství německé historiografie, pak se v tomto projektu jedná o zkoumání tzv. druhé a třetí fázi pojetí chudoby. Stranou tedy ponecháme tradiční středověké posuzování chudinství jako neřešitelného problému a soustředíme se na pojetí chudinství, které je vázáno nejen na jeho odstranění prostřednictvím výchovy chudých k práci, ale i na profesionalizaci, byrokratizaci a etatizaci sociální práce. Snaha podat neideologicky pojaté dějiny sociálního myšlení a sociální praxe v kontextu s výskytem a potíráním chudoby ve středoevropském prostoru od poloviny 18. do poloviny 20. století získává na prestiži nejen ve vnitřním provozu historické vědy. Společenská aktuálnost této u nás do nedávna opomíjené tématiky vyplývá i z historického poznání, že chudoba nebyla a není záležitostí jen okrajových skupin společnosti, ale že vždy měla a také má spíše charakter masového, strukturálního problému. Praktické potírání chudoby, dále diskursy o chudobě a nakonec systematická chudinská politika byly také základním vodítkem evropských společností na cestě k sociální modernizaci. Historici se svou neodbytnou odbornou instrumentalizací minulosti mohou připomenout současníkům nejen fungování minulých modelů řešení nejrůznějších společenských problémů, ale také mohou upozornit na možnosti řešení palčivých sociálních problémů současnosti a na jejich kontextualizaci v různých ekonomických, kulturních a sociálních prostředí. Socialne-symbolicke jednáni: Fredrick Jameson a implikace pro sociologii kultury? která se uskuteční 24.–25. 5. 2012 v prostorách Právnické fakulty Univerzity Palackého v Olomouci. Prof. JUDr. et PhDr. Karolina Adamová, DrSc. "Soukromé právo v proměnách věků"
Letní škola je určena všem studentům právnických fakult magisterských, doktorských a bakalářských programů. Cílem školy je studentům poskytnout určitý ucelený přehled o vývoji soukromého práva a jeho východiscích od nejstarších dob do r. 1989. 1. Regulae iuris a vliv římského práva na soukromé právo. 2. Vliv římského práva na právo věcné, dědické a obligační. 3. Vybrané otázky českého středověkého závazkového práva. 4. Vis maior a custodia v římském právu a středověkých právních knihách. 5. Savigny, Thibaut a Zeiller – odpůrce, propagátor a autor kodifikací občanského práva v 19. stol. 6. Všeobecný rakouský občanský zákoník. 7. Rekodifikační pokus v první Československé republice. 8. Změny v soukromém právu v období Protektorátu Čechy a Morava. 9. Římsko-právní úprava rodinného práva. 10. Vývoj rodinného práva od ABGB do roku 1945. 11. Poválečná úprava práva rodinného. 12. Občanské právo hmotné v období socialismu. 13. Předpoklady vzniku obchodního práva jako samostatného právního odvětví. 14. Charakteristika hospodářského zákoníku. 15. Zákoník mezinárodního obchodu. Ústav pamäti národa v spolupráci s Katedrou všeobecných dejín Filozofickej fakulty a Katedrou právnych dejín Právnickej fakulty Univerzity Komenského organizuje pri príležitosti 70. výročia prijatia tzv. Židovského kódexu (nariadenie č. 198/1941 Sl. z. o právnom postavení Židov) vedeckú konferenciu Protižidovské zákonodarstvo na Slovensku a v Európe, ktorá sa uskutoční 8. – 9. septembra 2011 v Bratislave. Cieľom podujatia je prezentovať výsledky výskumu v oblasti protižidovského zákonodarstva a vymedziť jeho úlohu v procese prenasledovania a likvidácie židovskej komunity. Konferencia má priblížiť využívanie existujúcich právnych noriem na perzekúciu židovského obyvateľstva, tvorbu nového protižidovského zákonodarstva a ukázať vzájomný vzťah protižidovskej legislatívy, diskriminácie a likvidácie židovskej komunity v 30. a 40. rokoch 20. storočia. Konferencia má poukázať na spoločné črty protižidovskej legislatívy, ale aj na jej špecifiká v jednotlivých krajinách. Rasové, náboženské a sociálne základy protižidovského zákonodarstva a úloha náboženského, národného, hospodárskeho a politického antisemitizmu pri jeho vzniku. Vymedzenie legislatívnej právomoci jednotlivých štátnych inštitúcií v procese tvorby protižidovského zákonodarstva a jeho uplatňovania. Definícia pojmu Žida, obmedzovanie počtu Židov vo výkone povolania, vylúčenie z volebného práva a verejnoprávnych funkcií, vylúčenie židovských študentov a žiakov zo škôl, domové prehliadky, zákaz zhromažďovania, evidencia a označenie židovských občanov a pod. Okruh bude zahŕňať diskrimináciu židovského obyvateľstva vo všetkých základných právach a slobodách okrem majetkových a tých, ktoré súviseli s jeho sústreďovaním a deportáciou. Arizácia a likvidácia podnikového, poľnohospodárskeho, domového, hnuteľného a kapitálového majetku Židov. Koncentračné tábory a strediská internačného a pracovného charakteru, pracovná povinnosť a deportácia Židov. Cieľom podujatia je predstaviť laickej i odbornej verejnosti najnovší výskum v oblasti protižidovského zákonodarstva, preto prípadných záujemcov prosíme, aby rešpektovali obsahové zameranie konferencie. pořádá 24. listopadu 2011 mezioborovou konferenci "Kontexty propagandy". Propaganda jako účinný institucionální nástroj ovlivňování veřejnosti ve smyslu přijetí jednoznačných obecných hodnot a vzorců jednání byla mocenskými elitami (či vážnými aspiranty na mocenské pozice) využívána odedávna, jak vyplývá z řady odborných reflexí zaměřených právě na toto téma, ať už z pohledu historie, sociologie, filozofie, lingvistiky, psychologie, ekonomie, politologie nebo tzv. postdisciplinárních kulturálních či mediálních studií. Na ně by chtěla tato konference navázat. Mezioborová perspektiva má hned několik předností, mezi nimiž dominuje časová i metodologická pestrost uchopení a analýzy konkrétních podob a konsekvencí propagandistických aktivit. Ta mimo jiné umožní konfrontaci přímých propagandistických forem a poměrně různorodých forem zastřených (nepřímých), poukaz na podmíněnost dobovým kontextem či další rysy persvazivního nátlaku. Mezioborové setkání bude jistě podnětem ke kladení nových otázek v odborné diskusi o tématu pro naši současnost nanejvýš aktuálním. Konferenční příspěvky budou zveřejněny formou recenzované publikace. Konferenční poplatek činí 500 Kč.